August 13, 2017 – Mike Hennessy, Sr.
August 14, 2017 – CHARLES L. SHAPIRO, M.D. August 01, 2017 – WILLIAM TSENG, M.D. New therapies are emerging for the treatment of cholangiocarcinoma, a rare type of cancer that is not often discussed. IN 2011, AT AGE 46, Patty Corcoran was in great health. The Olney, Illinois, resident ate right, exercised regularly and was devoted to her job as a social worker, helping low-income families access needed resources. So, when she ended up in the local hospital’s emergency room with a stabbing pain in the right side of her abdomen, she assumed the gallbladder surgery for which she was subsequently scheduled would be fairly routine. A pre-operative sonogram led to a phone call she wasn’t expecting — it was her doctor, canceling the next day’s surgery. Something wasn’t right, and Corcoran was soon on her way to the Mayo Clinic in Rochester, Minnesota. There, a biopsy confirmed a diagnosis of intrahepatic cholangiocarcinoma, a rare cancer of the bile ducts inside the liver. She had a tumor that measured nine centimeters by 10 centimeters. “I was told it was inoperable,” Corcoran says. “They told me I had six to nine months to live.” Today, nearly seven years later, Corcoran continues to be treated for the disease and has become both an inspiration to, and advocate for, others diagnosed with cholangiocarcinoma. Through her blog, Patty’s Journey of Faith, (pattysjourneyoffaith.blogspot. com), and speaking at events such as the annual conference of The Cholangiocarcinoma Foundation, Corcoran has helped to give a voice to those affected by this rare disease. Approximately 8,000 people in the United States are diagnosed with cholangiocarcinoma each year, according to the American Cancer Society (ACS), although the actual numbers may be higher because the disease is challenging to diagnose. In fact, cholangiocarcinoma is sometimes found incidentally during an ultrasound or CT scan of the liver for other reasons, according to Rachna Shroff, M.D., assistant professor of gastrointestinal medical oncology at The University of Texas MD Anderson Cancer Center in Houston. “There is no routine screening for this disease,” she says. Cholangiocarcinoma, also known as “bile duct cancer,” includes cancers classified in two ways: intrahepatic and extrahepatic. Intrahepatic cholangiocarcinoma is cancer in the network of slender tubes that carry bile inside the liver, while extrahepatic cholangiocarcinoma is cancer in the bile ducts outside the liver. Extrahepatic cholangiocarcinoma includes cancer in the perihilar bile duct in the hilum region — the area where the right and left bile ducts leave the liver and come together to form the common bile duct, also known as Klatskin tumors — and cancer in the common bile duct in the distal region, where the common bile duct crosses the pancreas and ends by connecting into the small intestine. Making a cholangiocarcinoma diagnosis depends on the location of the original tumor, says Shroff. “Intrahepatic cholangiocarcinoma is harder to diagnose,” she says. “Its symptoms are more vague.” Those symptoms can include fatigue, weight loss, feeling full faster than normal and pain that appears as tumors grow and stretch the surrounding “capsule” of the liver, she says. The most common presenting symptom of extrahepatic cholangiocarcinoma is jaundice. More awareness of cholangiocarcinoma among physicians, improved imaging techniques and new pathology tests are among the factors that contribute to an increasing number of diagnoses — particularly of intrahepatic cholangiocarcinoma, says Lipika Goyal, M.D., a gastrointestinal medical oncologist at Massachusetts General Hospital and an instructor at Harvard Medical School, both in Boston. She cites a test developed and used at Mass General, albumin mRNA in situ hybridization, which detects cell patterns related to cholangiocarcinoma — as particularly promising in its ability to accurately diagnose intrahepatic cholangiocarcinoma. She also cited the fluorescence in situ hybridization (FISH) assay developed at Mayo Clinic for improved diagnosis of extrahepatic cholangiocarcinoma; this assay detects abnormalities in the structure or number of chromosomes in the cancer cells by using fluorescently labeled DNA probes to look for changes that may indicate a malignancy. Risk factors for developing the disease include chronic inflammation in the liver, infection with hepatitis B or C, cirrhosis of the liver, a history of inflammatory bowel disease (particularly primary sclerosing cholangitis — inflammation causing scars in the bile duct) and fatty liver disease, says Shroff. While cholangiocarcinoma is more common in Southeast Asia, where it is associated with infection by parasites, or liver flukes, it is much less common in the U.S. It is rarely associated with any hereditary syndromes, according to Shroff, and it mainly occurs in people age 70 and older. Survival rates vary for patients with cholangiocarcinoma depending on whether it is intrahepatic or extrahepatic, and if it is localized or has spread. For localized intrahepatic cholangiocarcinoma, the median 5-year survival rate is 15 percent, but drops to 6 percent for regional and 2 percent for distant. Patients with extrahepatic cholangiocarcinoma have a 30 percent chance of surviving five years if it is localized, whereas that rate drops to 2 percent if distant, according to the ACS. As with any cancer, these estimates may be quite off for any individual person since as of yet unknown biological factors can influence outcome. Clinicians use a variety of methods to treat cholangiocarcinoma, yet the only potentially curative treatment is surgery. Sometimes, a technique called portal vein embolization, in which blood supply is cut off to the diseased part of the liver to encourage growth in the healthy portion, can be done. Tumor location is critical in making these treatment decisions. Radiographic imaging is used to quantify tumors and look at the liver’s volume to determine whether resection is an appropriate course, Shroff says. As for liver transplant, she says its role is “more experimental” for intrahepatic cholangiocarcinoma. Some patients with Hilar cholangiocarcinoma (extrahepatic) could be considered candidates for liver transplant, if there has been no lymph node involvement or metastasis. New chemotherapy combinations for treating cholangiocarcinoma are a subject for further study, according to Shroff. 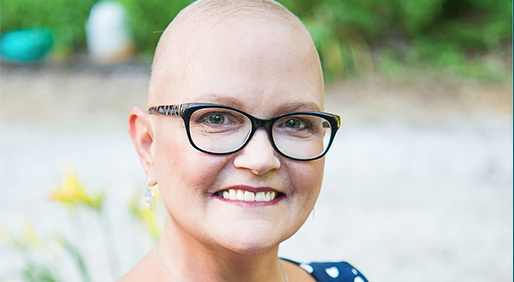 She and her colleagues at MD Anderson Cancer Center have completed a trial — NCT02392637 — adding Abraxane (nab-paclitaxel) to gemcitabine and cisplatin for newly diagnosed patients. The study, which was presented at the 2017 American Society of Clinical Oncology Annual Meeting (ASCO), showed that the combination was well tolerated at adjusted doses in 51 patients. Median progression free survival was 11.4 months and only four patients experienced grade 4 toxicities. Ten patients experienced grade 3 toxicities like nausea, diarrhea and inflammation of the bladder. “Combinations like this are showing promise to add more chemotherapy options to our armamentarium,” she says. Corcoran, who travels from Illinois to Texas to be treated at MD Anderson Cancer Center, says she started out with cisplatin and gemcitabine, but her body didn’t react well. Her doctor then switched to capecitabine and Tarceva (erlotinib). While taking chemotherapy drugs, she experienced side effects, including rashes and blood clots. When biopsy results showed cancer in two lymph nodes close to her liver, she began a course of intensity modulated radiation therapy, which allows for precise radiation doses to a tumor or specific area. According to the ACS, other types of radiation used in treating cholangiocarcinoma include three-dimensional conformal radiation therapy, stereotactic body radiation therapy and — less commonly — intra-operative radiation therapy, proton beam radiation therapy and radioembolization, a technique in which radioactive beads are injected into blood vessels near the tumor. “Radiation for cholangiocarcinoma is done on a case by case basis. If the disease responds to upfront chemotherapy and there is no spread outside the liver, radiation may be considered,” says Shroff. Beyond more traditional options like chemotherapy and radiation, several new biological drugs for treating cholangiocarcinoma are emerging — targeted therapies among them. “Cholangiocarcinoma is molecularly interesting,” says Shroff. “Approximately one-third of patients have targetable mutations.” These include the IDH1 mutation and the fibroblast growth factor receptor (FGFR) mutation. When asked what advice she would offer to other people diagnosed with cholangiocarcinoma, Corcoran said, “Get genetic testing done immediately. That research includes a number of new drugs now in clinical trials. “There’s a phase 3 randomized trial of an inhibitor for the IDH1 mutation that’s showing promise,” says Shroff. In addition, Goyal mentioned two phase 1 trials, one of TAS-120, an FGFR inhibitor, and another with the combination DKN-01 with gemcitabine/cisplatin. Both of which seem favorable. According to Goyal, FGFR inhibitors can cause fatigue, high phosphorus, gastrointestinal (GI) side effects, vision problems and nail toxicities, while IDH inhibitors are generally well tolerated but can cause fatigue and mild GI side effects. Researchers are also investigating agents that target rearrangements or infusions of the NTRK genes in a variety of solid tumors, including cholangiocarcinoma. The STARTRK-2 trial (NCT02568267) is evaluating one such agent, entrectinib, which received a breakthrough therapy designation from the FDA in May 2017. The trial is currently recruiting patients with locally advanced or metastatic solid tumors that harbor NTRK 1/2/3, ROS1 or ALK gene rearrangements. The oral agent LOXO-101 (larotrectinib) showed a positive response in patients with a range of TRK fusion-positive solid tumors. At ASCO, researchers stated that 12 percent of patients had a complete response and 64 percent a partial response. Immunotherapy is another area of promise. “These drugs help your immune system recognize and fight your cancer,” Goyal says. In a recent phase 1 study, approximately one third of patients with advanced cholangiocarcinoma or gallbladder cancer derived benefit from the PD-1 inhibitor Keytruda (pembrolizumab). Like Corcoran, Shroff encourages patients to ask their physician to order molecular profiling. Currently, this is primarily to identify clinical trials that could be useful, but every now and then, may point to a conventional therapy that otherwise may not have been considered. “It’s an important piece of information,” she says. Though she’s had her ups and downs throughout treatment, dealing with side effects and unexpected complications, Corcoran’s attitude stays pretty positive. She enjoys helping others learn about the disease and its potential treatments.